Tony came to the Ambleside 2 condominium complex mainly for the view overlooking the Ottawa River. He figured it was a convenient and safe place to see interesting birds from the comfort of a balcony. He wasn’t disappointed. In fact, the view surpassed all his expectations. Free of ice in winter, and active with birds all year, Deschenes Rapids is an ideal environment to see different species of birds that pass through our region. As it turns out, he’s not the only one looking for birds from our building. Ambleside 2 is an attractive spot for Peregrine Falcons – formidable avian predators, specializing in hunting birds. Although the Falcons have an all-you-can-eat buffet on the river, they frequently hunt around our high rises of Ambleside 2, often looking for pigeons. 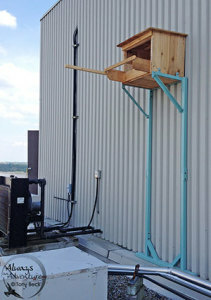 Since we occasionally see a pair of adult Peregrines perching on our building, we suggested to our Board of Directors to place a nest box on the roof. We’re happy to announce that, thanks to members of the board, it’s been built and placed on our roof. 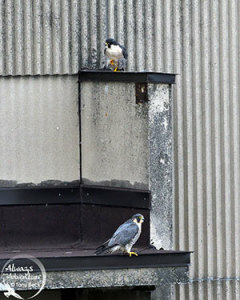 However, we still need to attract a bonded pair of Peregrines to the nest. This typically happens in spring. Unfortunately, it’s too late for this year. Perhaps next year. 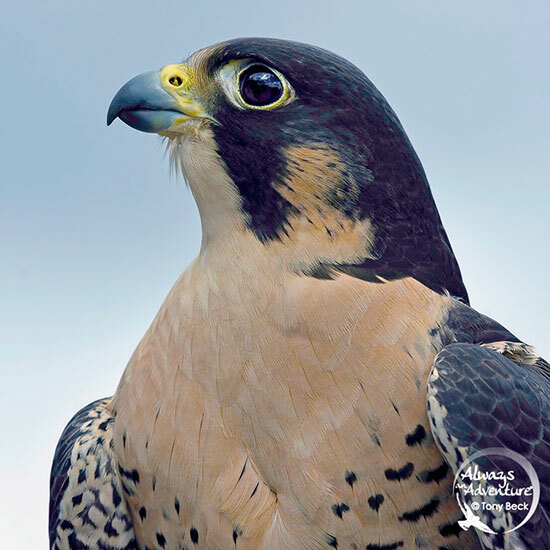 The Peregrine Falcon is one of the top predators in our area. This powerful flyer holds the world record for fastest speed of any animal – 242 mph (389.46 km) in a stoop. Once considered highly endangered and nearing extinction, they’ve made a gradual comeback. DDT in the food chain was considered the main cause of their decline. Thankfully, Canada banned the pesticide in 1970. In 1987, Tony found an active nest on a quarry wall of nearby Bristol Mines, Quebec. This was the first nesting record for our region in modern times. Now, these falcons nest regularly along the Gatineau Escarpment, and also on a few of Ottawa’s taller buildings. Their recovery from extinction is partly due to re-introduction programs and placement of artificial nest boxes, like the one on our building. They are part of a major environmental success story. In 2002, Canadian classifications downgraded their status from “threatened” to “species of concern”. Not many endangered animals are lucky enough to get downgraded. About the size of a crow, Peregrines are sleek & powerful-looking predators similar to hawks. They have long pointed wings with stiff and quick wing beats. Adults have bluish-gray backs and upper wings. But, the best way to tell them apart from other birds is their distinctive dark helmet-like facial pattern. Young Peregrines are brownish for about one and a half years. There are other similar species that patrol our building, but they usually nest in trees. Merlin is a powerful little falcon that sometimes perches on our building, but it’s considerably smaller than a Peregrine. Although it mainly hunts small birds, Merlins will sometimes take pigeons larger than themselves. We also occasionally see Cooper’s Hawks fly around Ambleside. But, they have a different facial pattern and a much longer tail. They often take pigeons, sometimes capturing them in mid-flight, just like Peregrine Falcons do. Peregrines natural nesting habitat is typically on high cliffs like those along the Gatineau Escarpment. Fortunately for us, birds believe high rise buildings resemble cliffs. A pair of Peregrines defend a breeding territory of 1 kilometre or more but will hunt over a larger area if necessary. They will defend their nest, young and territory against all potential threats including other birds and people. So, it’s best to minimize disturbing the nest during the critical nesting period – from late March to late July. Hopefully, we will find funding for a webcam so we don’t have to disturb the nest during the most sensitive time period. Interestingly, bonded pairs are loyal to each other and mate for life. They’ll return back to their territory each spring. Females are always slightly bigger than males. Otherwise, both genders look similar. Sometimes pairs will spend the entire year around their territory. Keep your eyes out for these majestic birds of prey. It would be an honour to have them make Ambleside 2 their home.